Determining whether an invention has already been patented or disclosed to the public is one of many important steps an inventor should take on the long road to bringing a new product to market. It makes good sense to have, at the very least, a general understanding of what’s out there before diving into the turbid waters of patenting an invention. Performing an initial patent search using public databases can be a useful first step, and there are a number of free resources available for the public to use. Google Patents is a free service capable of producing a set of workable preliminary results. This post will attempt to introduce inventors to searching for prior art with Google Patents and discuss the relative strengths and weaknesses of this particular service. The thought of performing a prior art search can be very intimidating at first. It takes a considerable amount of time to read and sift through each and every patent, patent application and printed publication before making a determination as to whether to move forward with patenting an invention and bringing it to market. There’s a lot work involved with little guarantee that each and every piece of information material to the patentability of an invention will be found. Furthermore, it takes practice to not only gain an understanding of how a particular service works, but to become proficient at using that particular service as well. But devoting a little time searching for prior art early on can end up saving an inventor thousands of dollars and years of frustration down the road. 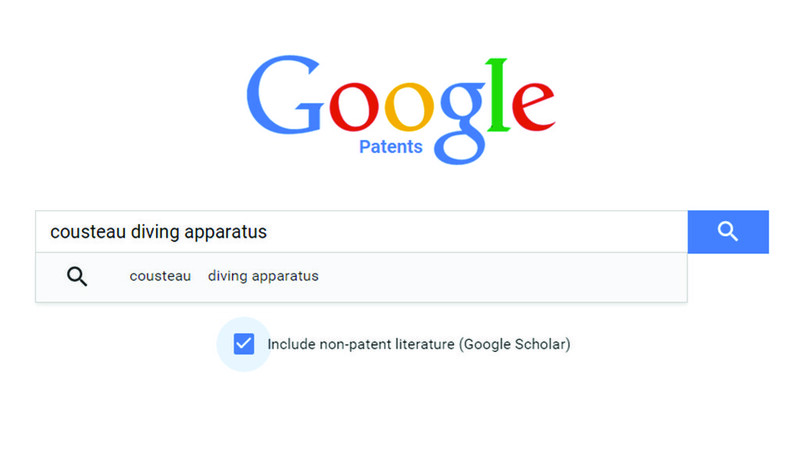 Just for background reference, Google has been attempting to make patent searching easier for inventors by providing a search engine dedicated solely to finding patents and printed publications free of charge since 2006. Over its nearly nine year history, Google has been updating their search algorithms and incorporating international patent data to their patent search feature. Google claims to have all issued U.S. patents since 1790 in their search feature. Since 2012, Google has employed a prior art finder which incorporates publications from their academic search engine, Google Scholar. In 2015, Google introduced an experimental marketplace for the buying and selling of patents. Currently, Google provides access to patent applications and issued patents from the United States Patent and Trademark Office (USPTO), the European Patent Office (EPO), German Patent and Trademark Office (DPMA), Canadian Intellectual Property Office (CIPO), World Intellectual Property Organization (WIPO), and the State Intellectual Property Office of the People’s Republic of China (SIPO). Applications not written in English are translated using Google’s translation services. On July 16, 2015, Google launched a completely new version of their patent search feature. Aimed at providing a searcher with more useful results, Google’s updated search algorithm now arranges results by clustering them by Cooperative Patent Classification (CPC) numbers, and provides greater integration with Google Scholar to display technical journals and other publications. Consistent with Google’s overall mission, Google Patents hopes to be able to provide inventors, and the patent community as a whole, all material information related to a particular invention in one place. Using the newest version (the original version and advanced patent search features are still available at the time of writing) of Google Patents is relatively simple. A search begins with formulating a group of relevant keywords. Sometimes, finding keywords is as simple as reciting from memory. Other times, it may take a thesaurus. On certain occasions, an inventor might wish to confer to technical journals and manuals for further ideas. If a particular inventor or innovator is known, chances are good that Google’s search algorithm will find and display that inventor’s most relevant works. After coming up with a good set of keywords, all one has to do is enter those keywords in his or her search query (for demonstration purposes, I decided to enter three words: “cousteau” “diving” and “apparatus”) to find patents that have at least one of the selected keywords. Google’s search algorithms and semantic search features have improved to the point where entering the right keyword can eliminate a considerable amount of guesswork. 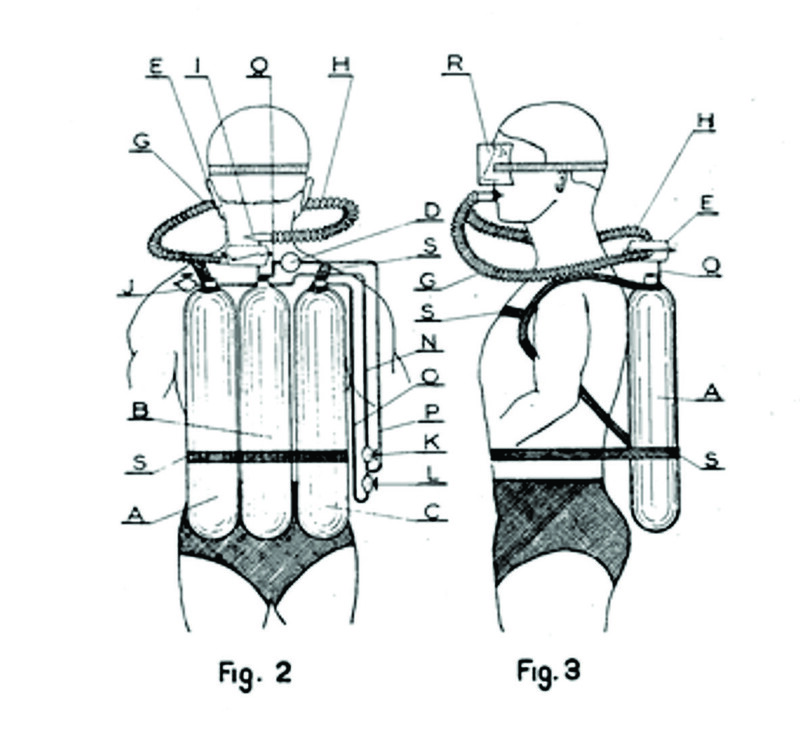 On the first page of results, two patents of historical significance issued to Jacques Cousteau were listed. Google Patents search results page including Prior Art Finder results. Examining the results after entering a keyword reveals a page similar to a typical search engine results page. However, a few differences immediately avail themselves. Displayed on the left side of the results page are the search terms that were entered along with a number of other available search features which can narrow down search results (e.g. inventor, filing date, CPC number). For example, new search keywords can be entered and old ones removed. By removing “cousteau” from the previous query and entering “SCUBA” and “regulator” into the search boxes, a whole new set of results will be displayed. The search results are organized and displayed by CPC classification number. By clicking on the question mark next to the CPC number, Google will redirect the user to the European Patent Office’s database, Espacenet, to give a more thorough breakdown of relevant CPC subclassifications. Google also provides the option to view all results in that particular classification number. Clicking on a patent link in Google’s search result page (for demonstration purposes, I chose the top one titled “Second stage scuba diving regulator“) reveals a treasure trove of information related not only to the patent itself, but to references cited in during the course of prosecuting that particular patent. At the top of the patent document is the Abstract, a short paragraph which describes the essential features of an invention. 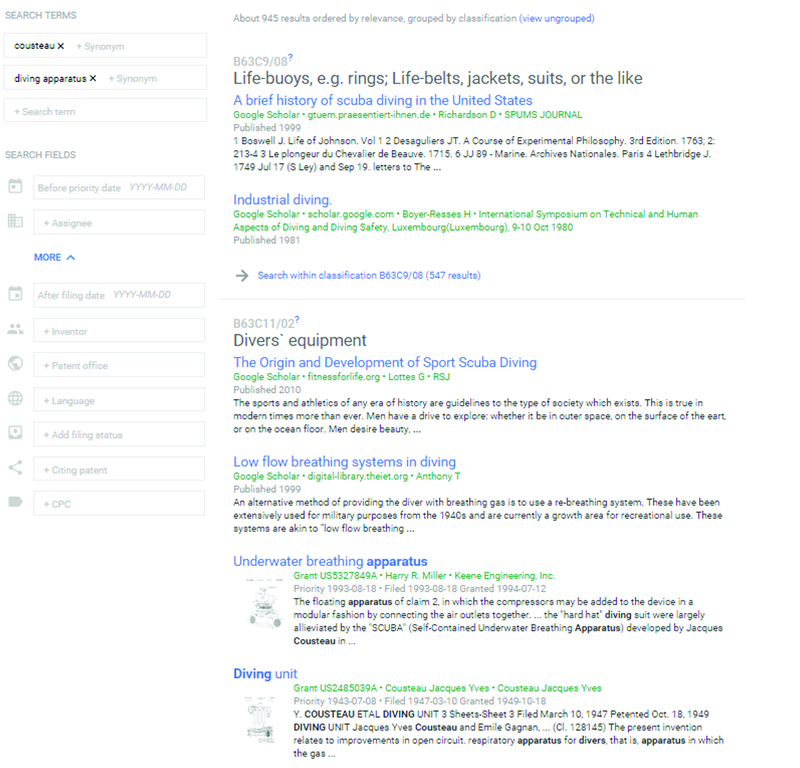 To the right of the page are a number of useful links. One can download a .pdf file of the patent document and/or use Google’s Prior Art Finder to uncover a number of further references which predate the patent. Below the Abstract are links to the patent drawings and the patent document’s CPC classification numbers. Below the classification numbers are the patent specification and claims. Finally, Google provides links to the prior art references cited in the prosecution of the patent as well as other patents which cite the patent being viewed. By clicking on one patent in one particular area, Google provides a number of links to a number of related patents. Top portion of Google Patents page for U.S. Patent No. 5,549,107. As one can see, patent searching using Google Patents can reveal a lot valuable information. It takes a bit of clicking around, but an inventor can readily discover patents and printed publications in a particular technological area. Using the information gathered from a Google patent search, a user can then organize his or her search data. A good way to do this is to create a chart or spreadsheet which includes patent titles, patent numbers, filing dates, inventor names, abstracts and links to each reference. Results can be organized by classification number as well. Downloading and saving .pdf files of issued patents and patent applications allows an inventor to build a virtual library of related patent information. Using Google’s Prior Art Finder, an inventor can pull up a number of scholarly works which may be pertinent to his or her invention. By creating and maintaining such a compilation, accessing further information using other services such as patent office databases now becomes much easier. Keeping a detailed record of what has been discovered along the way will ultimately make the drafting and filing of a patent application much easier. Finding patent information and interpreting what’s in that patent information are two distinct areas of knowledge though. Generally speaking, reading a patent abstract and specification will provide an inventor a basic understanding of what is covered in a patent. Legally speaking, the claims of a patent define what is covered in a patent. And here is where a professional patent search and patentability opinion done by a patent agent or attorney is the next logical step. As I have mentioned before, and will continue to emphasize, professional patent searchers have extensive training in searching multiple databases and have access to search tools and information not generally available to the public. Patent attorneys have both the scientific and legal training to not only understand the technical aspects of a patent, but to understand the legal boundaries of a patent as well. Google offers a great place to perform an initial search, but it is subject to a number of limitations. Keep in mind that patent applications are not published until eighteen months after being filed. Additionally, no search program out there is completely flawless. From my own personal experience, I have found Google’s search results to be inconsistent at times. For instance, when writing a post about the USPTO’s issuance of the nine millionth United States patent, Google did not have this patent in their search results until several days after the fact. As of publication of this post, the drawings for US9,000,000 are still unavailable (although the drawings are available on the published application). There are several more patents listed on Google with incomplete information as well. With time, one can expect this service to only improve. In the meantime, though, an inventor should check other databases for further information after searching on Google. Optimistically speaking, Google hopes to offer something akin to one-stop shopping with their patent search feature. Google has certainly made it known that it wishes to be influential in shaping patent law and policy, with some notable alumni now in high places at the USPTO. As part of the USPTO’s Enhanced Patent Quality Initiative, Google has made a number of suggestions to prevent the issuance of weak patents. Perhaps Google is moving towards a subscription based searching service or is just trying to develop and market newer search technology to the USPTO and beyond. For better or worse, one can only expect Google to continue playing a major role in the evolving world of intellectual property law. All in all, Google has provided inventors with a valuable resource. Using Google Patents is relatively easy. It provides fast results with useful links to other patent databases and related prior art. Pulling up a single reference is far easier and faster using Google than on other databases, and the numerous links to other citations can save a searcher considerable amounts of time. Downloading patents and patent applications in .pdf format is also very simple. I, personally, enjoy using Google Patents to find specific references as well as perform initial searches using their Prior Art Finder. Though it has its share of flaws, I believe that Google will continue to improve and expand upon an already beneficial service.